On April 24th, 2013, the Rana Plaza building in Bangladesh, Dhaka collapsed. 1138 people died and 2500 people were injured. Most of the people that died were young women who used to make clothes for some of the worlds biggest high-street brands like Zara and H&M. This mishap led to the inception of Fashion Revolution week, which aims to spotlight the current issues faced in the entire supply chain of the fashion industry, to honour those that died in the Rana Plaza disaster and to celebrate the great sustainable work that exists in the fashion industry. Suki Dusanj, the Country Head for Fashion Revolution, is a part of this fast-growing tribe working to create as much noise as possible for a fairer, safer, cleaner and more transparent fashion industry. Here she talks about educating oneself about the detrimental effects of our buying habits on the environment and how Fashion Revolution is winning the war of sustainability against fast fashion waste. 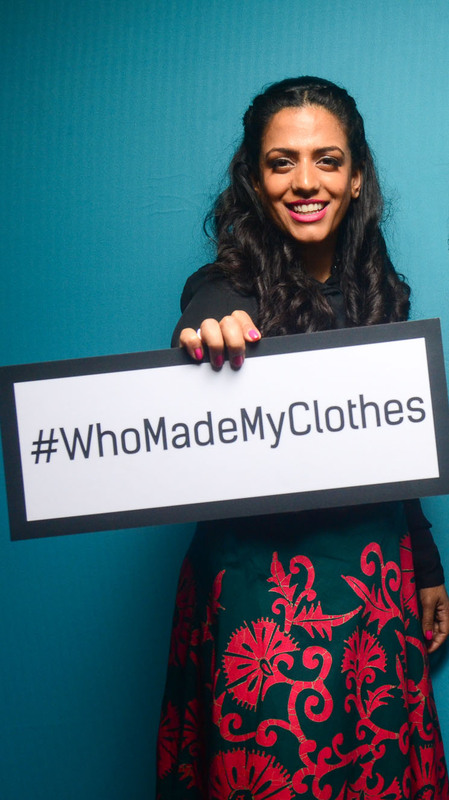 In 2017 we had over 113,000 posts with the hashtag #whomademyclothes, with a reach of 150 million and 533 million impressions on social media alone. Someone somewhere is listening and all of this data helps influence change. You cannot ignore what people are calling for and right now they are calling for a Fashion Revolution. Many people are so removed from how their clothes are made and know very little about what it takes to make one garment of clothing, neither do they know how many hands it passes to reach the shop store in which they buy from. I dream big and hope for the best one step at a time. I am the Country Head for Fashion Revolution India and an executive director at the Swiss-Indian Chamber of Commerce – we have offices in both Mumbai and Zurich. I wear two hats and sometimes on the same day! Two gravely different jobs with networks that intertwine and complement one another. I live between India and Switzerland, and we work to enhance the bilateral relationship between Swiss-Indian business. This role enables me to develop relations between the two countries and their business networks with members and board members that are some of the most influential businesses and founders in the world. I am surrounded by enterprising brilliance and I get great joy from connecting people to one another and developing positive relationships for good business. I have a professional portfolio that shows my commitment to campaigning for positive change in various industries, and yet, I also enjoy corporate business life. I believe that being kind on your way up is one of the most important values you could uphold. Coming from a large family of six children, four of which are girls we often shared clothes or received hand-me-downs, which was the norm back in the day. This, I guess, was my first ever experience of “clothes swapping”. Some of my earliest memories of clothes is remembering that we often had fabric at home from which we made our own clothes. Living in the UK in the 1980’s meant there weren’t many shops to buy Indian clothes from, so for special occasions, we made our own. My mother also taught us how to knit, sew and cut clothes so that we were empowered to make our own too. This is when I understood how long it takes just to make one outfit. What draws me to sustainable fashion is that there should be no other option other than sustainable. Sustainable shouldn’t be a “thing” a “phase” or a “niche” – it should be the norm. How awful is it that the textiles industry is one of the most polluting in the world. I believe that it should be mandatory for every single person who wears clothes to make clothes in order to educate themselves in what it takes to make one garment and to have a new found respect for each garment they buy or wear. People are buying in vulgar volumes with not a care in the world about the impact on the environment. This short-term fix for fashion will have a disastrous long-term effect on our planet. What does sustainability entail and what makes a brand sustainable are big questions, however, in simple terms, to be sustainable you must live within your resourceful means and develop with a positive impact for the future economically, environmentally and socially. Sustainability is a long-term approach rather than a short-term fix. My personal favourite brands that are driving change to make the fashion industry more sustainably conscious are Akaaro – Gaurav Jay Gupta, Bethany Williams, Beautiful Soul – London, Rouka by Sreejith Jeevan, Vraj Bhoomi, Stella McCartney, Tilla by Aratrik Dev Varman, Harare NY, Poochki, Swoon by Sakshi Astir. For children’s clothes, I adore lovetheworldtoday.in. Two designers to look out for are Bethany Williams and Tilla by Aratrik Dev Varman. We worked with both on the “Crafting Futures” programme this Fashion Revolution week. They went to Tripura, Assam to learn about the craft of the women weavers in that region. Aratrik is originally from there and he guided Bethany on that journey from village to village, tribe to tribe. Both designers will be collaborating to spotlight weaves and crafts from that region. Think before you buy. Ask yourself – do I really need it? Waste fewer clothes. Our landfills are bursting at the seams and are loaded with fast fashion waste. People are buying more than ever and they are throwing away like its in fashion to do so. It is crazy and thoughtless. Educate yourself – read our website for guidance and reports or links to other sites in our community: www.fashionrevolution.org. Always read a label – get to know your fabrics. Understand the effect that fabric has on the environment and the washing guide on the labels of your clothes. Repair and re-wear as much as possible rather than throwing worn out clothes away – think about fixing them!